(Boston, MA) – BOND, the Northeast’s premier building, civil, utility and energy construction firm, celebrated the topping off of Brandeis University’s new residence hall. 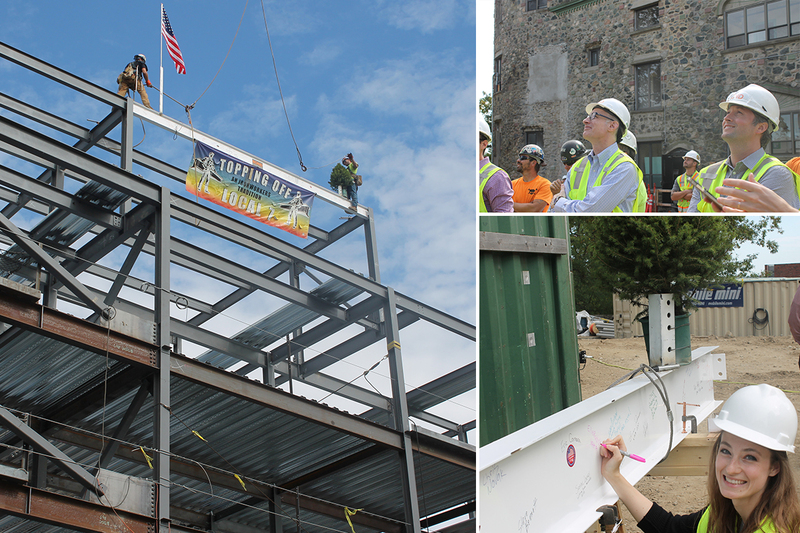 The ceremony marked the last steel beam raised on the new building, designed by William Rawn Associates. It was attended by the Brandeis University community, the project team and design partners. BOND is providing preconstruction and construction management services for the new 50,000 SF building, that will be the most sustainable facility on campus. The building features the following: roof-top solar array, geothermal heating and cooling, a wide central staircase, shared spaces for collaboration, large kitchen area, study space, four lounges, a courtyard and A/V and acoustic equipment. In addition, BOND renovated the famed Chum’s Coffee House, located within the adjoining Usen Castle, which opened early for the fall 2017 semester. The project is on-track, within-budget and slated for completion August 2018.